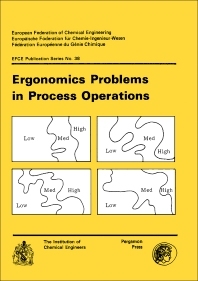 Ergonomics Problems in Process Operations documents the proceedings of a symposium organized by the Institution of Chemical Engineers in association with the Ergonomics Society, held at the University of Aston in Birmingham, on 11-13 July 1984. The objectives of the symposium are: to enable engineers from process, power, and offshore industries to exchange information and experience with ergonomics specialists; to discuss ergonomics problems in process operations and methods of recognizing and controlling these problems; and to explore effective ways of applying ergonomics research to solving process operations problems. The symposium is intended to appeal to operations and maintenance managers, equipment designers and project engineers, designers and managers of pilot scale R & D plants, and ergonomists. The presentations in this volume are organized into three parts. Part 1 contains papers on the role of the human operator. Also included are contributions during workshops on the effects of monotony and reduced activity in automated plant monitoring and human reliability assessment techniques. Part 2 contains papers on interface design and contributions during workshops on expert systems applications and ergonomics implications of computer-based display and control systems. Part 3 deals with studies on job design, organization, and training.